Record profits posted by the US Banking Industry of more than $42 Billion for the second quarter of this year. After reading the data below, read Joe Bialek’s, Good Questions Regarding CEO Pay, here. Passbook Savings rate (source, Bankrate.com). Total Bank Average, Annual Percentage Yield 0.04%. Certificate of Deposit rate (source, ibid). $5,000 minimum deposit, minimum of Five (5) years, Annual Percentage Yield 1.0%. Under the above scheme Alaska is returned to Russia - let President Putin deal with Sarah Palin (five-to-one he has her in the sack within a week) - and Hawaii reverts to tribal monarchial rule. 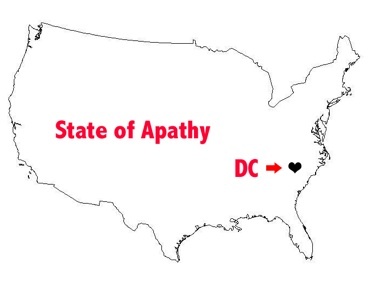 The State of Apathy is represented in Congress by three Senators and 12 House members, a mix of Republican and Democrat, since they’re both idealistically the same, anyway, and the office of President is replaced by the office of Grand Imam (or Caliph).